First of all, I want to say that my 3rd issue of Handknit Heros arrived in the mail and I’m thrilled to see it! CLF Member Mortaine is the owner and evil genius behind the hip and edgy comic. Crochet aficionados fear not the name “Handknit” one of the superheros in this comic is indeed a hookster like us! My kids (teens) adore the comic, and the patterns are well written for both knit and crochet. Yes, that’s right I can read the knitting patterns even if I can’t knit. I really like the diagrams in the last issue, they are well done. This leads me to the Set My Picot Free award, which goes to none other than Mortaine! CLF Member extraordinaire, a true handworking super hero. I urge you to look at her projects page on ravelry because she does it all! 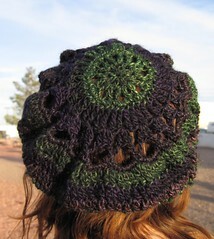 I particularly love this hat, but also her tatting efforts (gorgeous!). Mortaine, (aka Stephanie), you Set All our Picot Free with this cute and fun beret/tam. Love it!